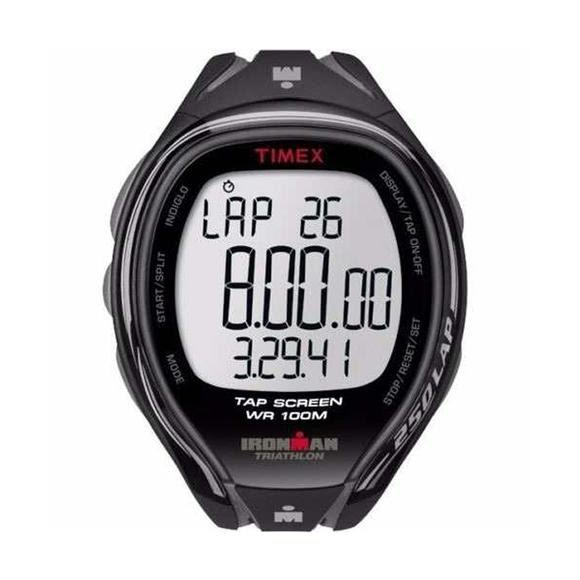 Featuring TapScreen™ technology, a large display and multiple features to help you manage your run the Timex Ironman Sleek 250 makes keeping track of your activity a breeze. Easily activates laps/splits by tapping anywhere on the digital watch screen and can be activated/deactivated when necessary. The Indiglo night light uniformly lights the surface of the watch dial using patented electroluminescent lighting technology. Your watch is water resistant if it has the wave symbol etched into the back of the case. Water resistance is measured and rated by depth in meters. The tests are made by subjecting the watches to water pressure (see table below, p.s.i.a. = pounds per square inch absolute). DEPTH Equivalent Immersion 30 meters = 98.4 feet 60 p.s.i.a. 50 meters = 164 feet 86 p.s.i.a. 100 meters = 328 feet 160 p.s.i.a. 200 meters = 656 feet 284 p.s.i.a. The watches will withstand water pressure up to their respective ratings as long as the lens or crystal, crown or push buttons and case remain intact.